Even though we have been in Sydney a few times now, it still keeps us busy every time we are here! On the programme this week were some new (nope, we haven’t seen it all …) and old-time favourites (the obvious, every-tourist-must-sees). We took part in an Instagram walk, an ideal event to meet some locals! 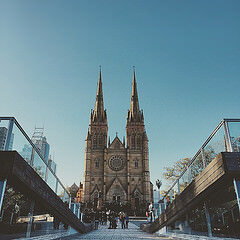 This Instameet was part of the Sydney HeadOn Photo Festival. We did take some great shots, although the walk took us along some of those old-time favourites, which isn’t characteristic to Instawalks. We were staying in Manly, a laid-back outer suburb of Sydney. We had passed the entrance from the Pacific Ocean to the Sydney Harbour so many times, and always wondered how we could have a closer look at it. We had been to North Head in the past, on the Manly side of the Gap, but never actually made it to the cliff itself. Time to bring some change to that! So, two ferry rides later – one from Manly to Sydney CBD (Circular Quay – the public transport hub), and one from Circular Quay to Watsons Bay, we found ourselves at a lovely small harbour. A short walk and we finally made it to that eyecatching gap! The view was just amazing! We met a friendly Aussie, apparently he had something to do with whale watching, and stayed there for a few hours. We knew there were dolphins in the harbour – one swam with the ferry for a short while – so we waited very patiently 🙂 The Aussie guy took off, well if you can do this every day why not, but we stayed and were rewarded with a spectacular show of about twenty dolphins finding their way to the ocean. This is officially the most beautiful spot of Sydney! From Watsons Bay we could walk to Bondi Beach, but since it was quite late in the afternoon, and being Autumn – meaning the sun sets at about 5 PM, we took a ferry to Rose Bay and crossed the small stroke of land to the other side. Now, there is a thing you should know: we are Belgians. We live in the Northern Hemisphere. Our Autumns are usually cold (if we are lucky about 10 degrees), dark and wet. Aussie Autumn (at least in Sydney) means usually about 20 degrees and sunny. Aussies think it is cold … So we took the opportunity to enjoy an empty beach and rock pool (a pool in the ocean, with ocean water, no chloride). And finally we ticked off a long lasting must-see on our list: the Luna Park at Milsons Point at the other side of the Harbour Bridge. (Un)fortunately it was closed, but we could walk around a bit (actually we would never pay such a ridiculous high price for a relatively small luna park). The roller coaster is still made out of the original wood which gives it a rather authentic look (the park is build around the 1930’s). And we’ve never been closer to the residences of the Prime Minister and the Governor General. So we’ve seen dolphins, seals resting at the steps of the Opera House, and the whale migration has started! Time to start the real trip soon! sunset sydney from Travel for Motion on Vimeo.